Cosmic cracks of thunder tore holes all round the darkness, and great howls loitered, gone and returned, gone and returned. The storm was building into jaws again. "It's raining in Ireland. It's been raining for as long as anyone can remember. Half the country is underwater and Dublin, criss-crossed by canals and buzzing with drones, is the province of violent gangs, drug-runners and human traffickers. Chief among them: the Earlie Boys, commanded by the man known as the Earlie King. 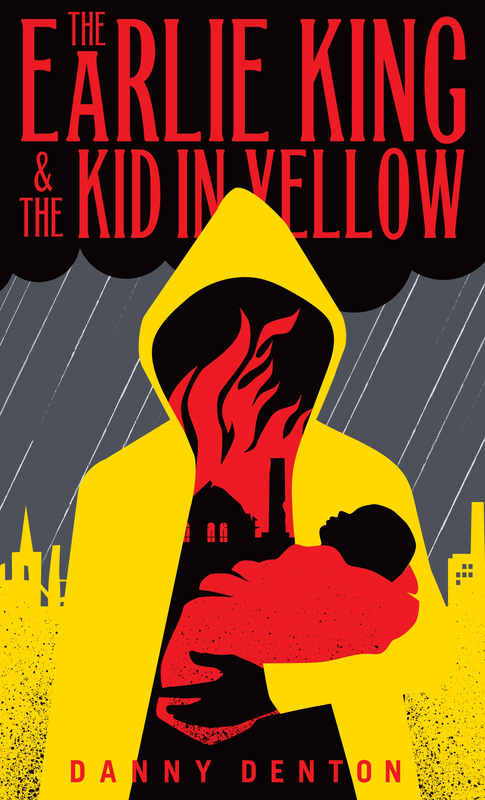 The kid in yellow – yellow skins, the ubiquitous waterproofs worn by everyone in the city – was once a runner for the Boys, but has been cast out in disgrace after getting the King's daughter pregnant. Now she's dead and all the kid in yellow wants is their baby, the babba, held captive by the King. The Earlie King & the Kid in Yellow depicts a society suspended between dystopian future and collapsed world. People still scroll through their devices, play videogames, and watch TV (though the terminology has become a little warped – 'TeleVisio', for instance). Yet the slide backwards into earlier beliefs and practices is already evident. A wandering preacher leads a group who believe a particular statue of the Virgin Mary can heal the sick and predict the future. There's a séance scene that could've come straight out of a Victorian novel. (Saint) Vincent Depaul is future-Dublin's pyromaniac Robin Hood, a champion of the poor who may be one man or a vigilante group. The tale of what happens between the King and the kid is told in several ways. We start off following a reporter who spies on the Earlie Boys. There's the first-person account of a former cop, told a while after the fact. There are extraordinarily vivid extracts from a play, which provide glimpses into the machinations of the King's cadre at the same time as they undermine the reliability of the whole construct. The fragmented approach encourages the sense that this story is a folk ballad, a patchwork of imagination, hearsay and myth. All the main figures are known by invented titles or have truncated or blank names that obscure their real identities, turn them into symbols. Meanwhile, in interludes, the spectre of Mister Violence – the postmodern bogeyman, the gleefully evil embodiment of all that's bad – stalks the city, peering over troublemakers' shoulders with a grin. Danny Denton has crafted such a richly imagined world here that I could spend hours listing every little detail I loved, from the clothes to the tech to the subtly altered language. (I was halfway through the book before the thought occurred to me that 'clap hands', a phrase commonly used to indicate agreement, might be a linguistic evolution of an emoticon – a spoken emoji.) The language is cracked and beautiful; the rain-soaked city could not be more evocatively depicted. Somehow, it's a sweet love story, a gangland thriller, and a dark dystopia all in one, and it works. It dazzles.